The Caribbean storms, hurricanes and turbulent weather can be dangerous and costly for your home or business. Talius has the ultimate solution to protect your home, business or institution from inclement weather. With products designed to be strong, durable and with the Caribbean weather patterns in mind they provide you with peace of mind during bouts of severe weather. Protect your property with the many storm and hurricane protection products provided by Talius. Talius rollshutters are the ultimate storm and hurricane solutions. Strong, durable and able to withstand high wind speeds, Talius rollshutters glide down when you need them and retract into a convenient overhead panel box when you don’t. Talius commercial and residential rolling shutters protect your windows from flying debris, not only saving you from incurring a costly repair fee but protecting the contents of your home or business. Be prepared for storms with Talius rollshutters that can be deployed at a moments notice. Talius rolling shutters provide you peace of mind knowing your home or business will be protected. Accordion Hurricane Shutters are a popular form of hurricane protection as they offer superior protection combined with ease of use. Accordion shutters are perfect for second story openings as they fold compactly to either side of an opening and can be closed from the inside. 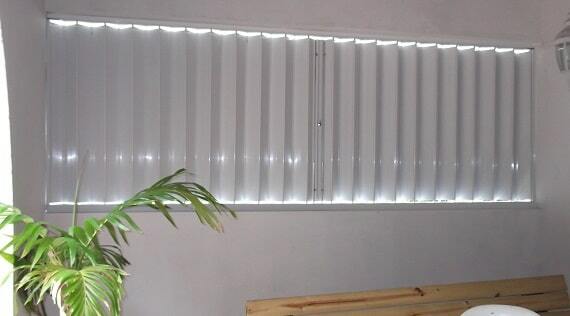 Accordion shutters also have the option of locking mechanisms on the exterior, interior or both. Talius exterior Bahama shutters provide superior hurricane protection with a tropical look and feel that won’t take away from your buildings decor. 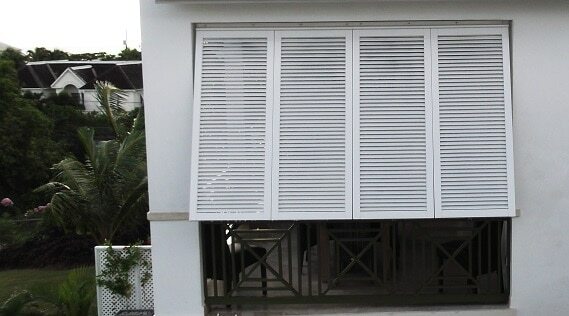 Bahama shutters are made with a series of slats that when closed provide storm protection and when open allow light and breeze in which keeping direct sunlight out. Bahama shutters are an ideal choice for fast protection from storms as they can be quickly closed and secured without lifting or the use of tools. Talius colonial shutters combine the decorative appeal of a traditional window shutter with protection against the high winds and flying debris associated with hurricanes. Colonial hurricane shutters are constructed out of multiple panels that can fold out to cover large openings and are hinged so they can be closed and secured easily without any lifting. Talius colonial shutters are nearly maintenance free and when open look like traditional decorative shutters, providing protection without taking away from the visual appeal of your building. Talius storm panels are a smart alternative to the traditional plywood used to cover windows during severe storms and hurricanes. Talius storm panels are easy to handle, store, are extremely strong and allow natural light to fill your space while the storm occurs outside. Storm panels are a great seasonal alternative for closure of porches and outdoor spaces as they keep wind and rain out while extending the use of the porch. Talius commercial and residential storm panels provide an effective and efficient alternative to other, more expensive storm protection options. 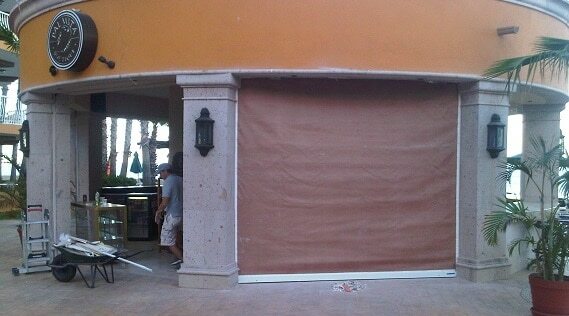 Hurricane fabric is another cost effective way to protect your building from flying debris in the event of a hurricane. Talius hurricane fabric for window and doors is a strong, lightweight woven fabric that is coated in a geo-synthetic PVC material that is used to cover windows and doors providing a barrier from flying projectiles and rain. Talius hurricane fabric is easy to store and easy to install during a storm making it a great alternative to the traditional plywood. Storms and hurricanes can be dangerous and costly and left unprotected your home or business is at risk. Talius provides practical and attractive solutions that work. With over 15 years of experience Talius is trusted to bring you solutions that protect you, your family, and your home or business. We are serving in areas like Grenada, Barbados, Dominica, St Lucia etc.